Luxury Villa at The Links Port Bouvard. Fully self contained with full Kitchen facilities. 4 Bedrooms, 2 Bathrooms (3 toilets). Baby cot and high chair available on request. Linen for baby cot NOT provided. 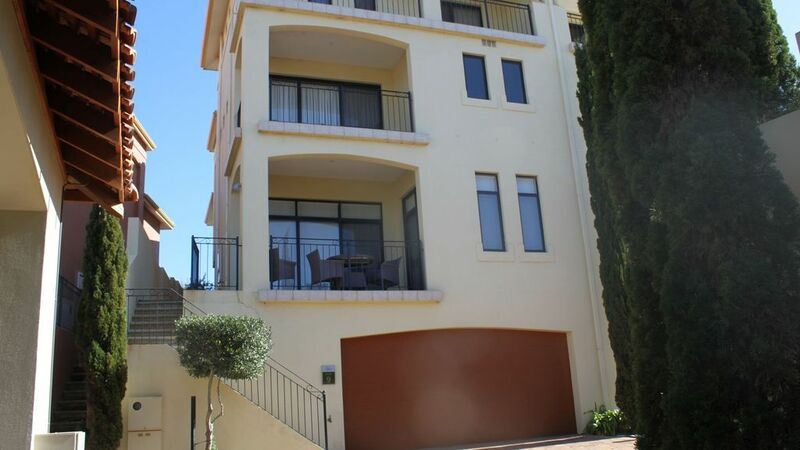 It is situated between the Golf course and is 200metres to the beach. Stroll down to the Country Club for a meal or drink. PLEASE NOTE: STRICTLY NO SCHOOLIES/ and UNIVERSITY LEAVERS BOOKING ACCEPTED. OVER 25 YEARS OF AGE ONLY. POOL AND SPA ARE CLOSED 1 JUNE - 31 OCTOBER. Only one hour south of Perth. A relaxing holiday destination. The Links Villa is situated 200metres from the Pyramids beach or, if you are a golfing enthusiast, a mere 5 minute walk to the Cut Golf Course. Ideal for families or as wedding accommodation. There are three bedrooms with large queen beds and a fourth bedroom with two single beds .2 bathroom 3 toilets. The Villa is in a secure gated complex with its own double garage. Take a walk to the beach through the golf course or just laze by the pool and spa, afterwards enjoying a BBQ in the communal alfresco area or stroll down the Country club for a meal or drink. The Cut Golf Course with the clubhouse and restaurant within walking distance which offers fine dining, alfresco dining, beers, wine and coffees to the public. A short walk to the Cut Canal where you can generally see the dolphins herding the fish into the canals, a great fishing spot and picturesque walks. Lovely house and perfect setting . Thank you Nola for your review. Happy to hear you enjoyed your stay. Excellent Property, spotless and quiet! Had a great relaxing time, property was spotlessly clean and getting the keys and getting was easy. Very secure and we will stay again. Thank you Emma for taking the time to review our villa. Happy to hear that you enjoyed your stay. Very nice place, family love staying here, Vern the caretaker was vary friendly. Milan the owner very easy to deal with. Thank you Geoff for taking the time to do a review. So happy that you all enjoyed your stay. This property is better than it looks on the internet !! Spotlessly clean with everything we needed. Spacious, comfortable and luxurious. My only regret is that we did not stay longer !! Thank you LeeAnne for your review. Happy to hear that you had a wonderful stay. Beautiful, immaculate, helpful friendly owner and well equipped home. We didn't want to leave. Thank you. So happy that you enjoyed your stay.